With necessity being the mother of the scoop dolly, it was originally designed to move our 10 ft. long, 94 in. tall, 500 lb. crated panel saws onto the freight trucks. This was typically done with one person on a forklift and one person steadying the load at the far end. This was a tricky dance between the forklift operator and the “point” man. 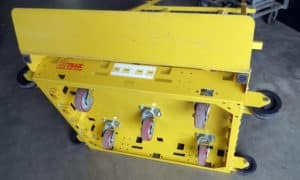 With the weight of the forklift entering a truck, the point man could be crushed by the panel saw falling over or with a slip of the foot of the forklift operator. So, the President of Saw Trax came up with a design that has been refined for many other applications. 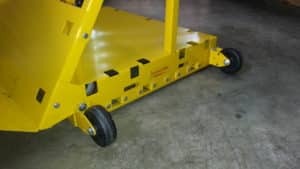 With the addition of the Ramp Wheels, the dolly glides over the loading dock transitions onto or off freight trucks. Now long, tall, heavy objects can be loaded more quickly, safely and cheaper since you don’t need a forklift. Brakes, come in a pair. Great for stabilizing dolly. 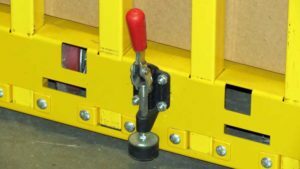 The toggle clamp slightly raises dolly taking the weight off of the wheels. 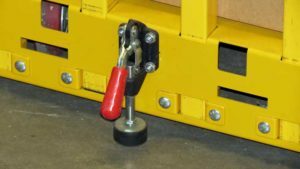 Used with thicker/deeper or heavier loads to use the weight of the user to step on the bottom lever while pulling on the top lever.